PRODUCT DESCRIPTION: Water based enzymatic odor destroyer which works well at killing off smoke, dead body odors, pet smells, urine, feces, insect odor, pheromones, trailing scent and more. Its especially good for skunk smells. 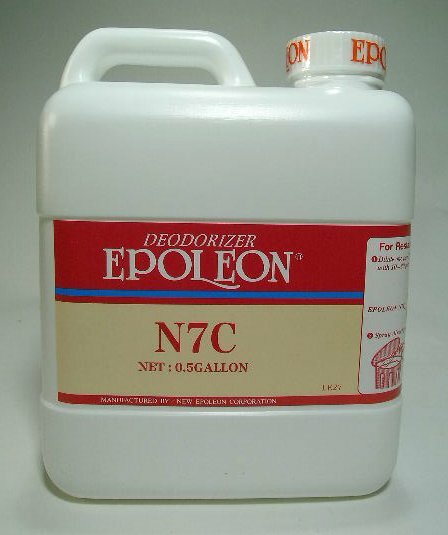 N7C works well when applied as close to the origin of the odor as possible but if you are not able to deliver it on top of this area it will work by being applied in surrounding areas. N7C neutralizes odors by attaching it's molecules to the bad smell molecules and then diffuses them altogether. This will happen as long as the bad smell is available and the supply of the N7C does not run out. When you are able to apply the material directly on where the odor originated from you will get immediate results. If you must apply it to peripheral locations expect to have to apply it a few times to get the desired results. N7C does not mask odors or cover them up. N7C can be shipped overnight if needed. And keep in mind that N7C has a slight odor which allows you to know it's still present and active where applied. If you need a product that works like N7C but is odorless, go with the NNZ. WHERE TO USE IT: Attics, wall spaces, crawl spaces, floors, cement, under decks, turf, rocks, side of house, etc. Pretty much anywhere you have an odor you want gone. And it's very safe to use around people and pets. Just keep them off the treated area till it dries and has a chance to work. N7C does not pose a hazard when used properly and can be reapplied as often as is necessary to defeat the offensive smell. 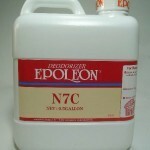 Remember you can also use N7C with our FOAMING TOOL because it's water based. The Foaming Tool allows you to create a thick foam which can then be injected into any wall where you suspect a dead animal is decaying. The foam does a much better job of delivering the N7C than does simply spraying the liquid into the wall void. And for large, open areas, using a FOGGER which will essentially "mist" the product is the way to go. If you don't want to purchase a Fogger outright, we do have a RENTAL FOGGER that can handle the job fine. RATE OF APPLICATION: Mix 12 oz of N7C per gallon of water and use this to treat 800 sq/ft of surface area (a crawl space measuring 20' x 20' will have 400 sq/ft of floor and 400 sq/ft of ceiling so use 1 gallon of mixed N7C to get this sized area properly treated). A 1/2 gallon jug will be able to treat up to 4,000 sq/ft. Porch smell gone! The product worked well for me. I used a fogger. It worked great. The smell underneath my porch is gone. I think cats were using the underneath of my porch to bring back prey they had caught. It had a dead animal smell. I blocked off the underneath of the porch to prevent other animal intrusions. I recommend the product.